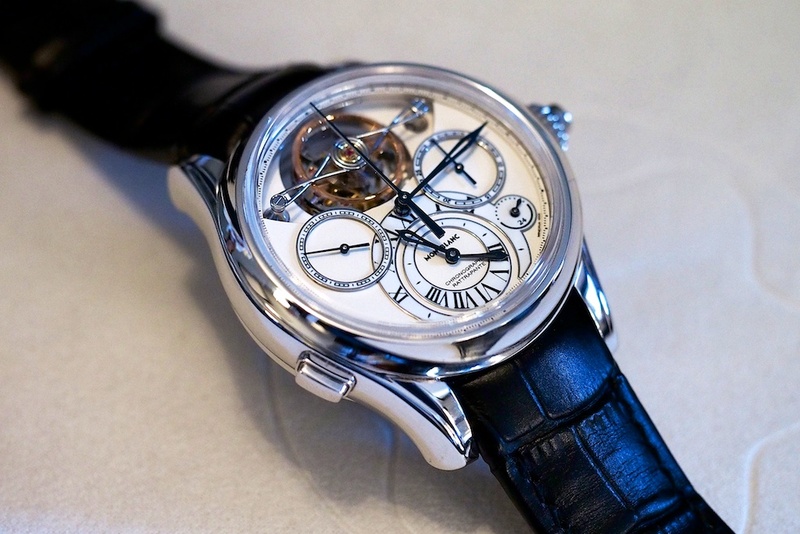 One of the distinguishing features of the Exotourbillon is its very elegant, elongated “infinity” upper tourbillon bridge –a most elaborate element, beautifully finished (the complex shape makes finishing it an especially time consuming, labor intensive process) as well as the tourbillon configuration itself. 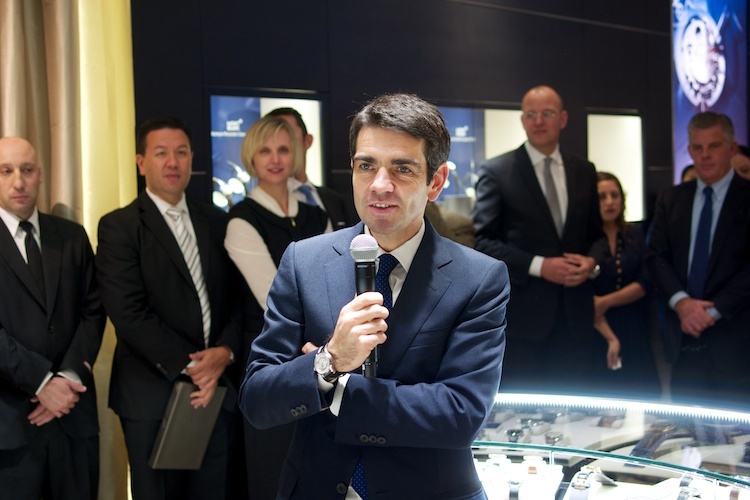 The Exotourbillon Rattrapante was first announced and shown in Hong Kong, at Watches and Wonders, and those of us in the USA finally had our first chance to look at it just this past week –when Montblanc also opened its newest New York boutique, at 600 Madison Avenue, with none other than new CEO, Jerome Lambert, in attendance as well. The boutique opening was a star-studded event with several notable celebrities on hand but to die-hard watch enthusiasts, the two biggest celebrities were undoubtedly Mr. Lambert and the incredible Exotourbillon Rattrapante. The regulator style dial, which shows the time in two time zones, is executed in gold and grand feu enamel; the split seconds hands are on the central axis, with a display for the running seconds as well as a 30 minute counter and day/night indication. We had a chance to try it out, and the start, stop, split-time, and reset functions were all as beautifully butter-smooth as you would expect. 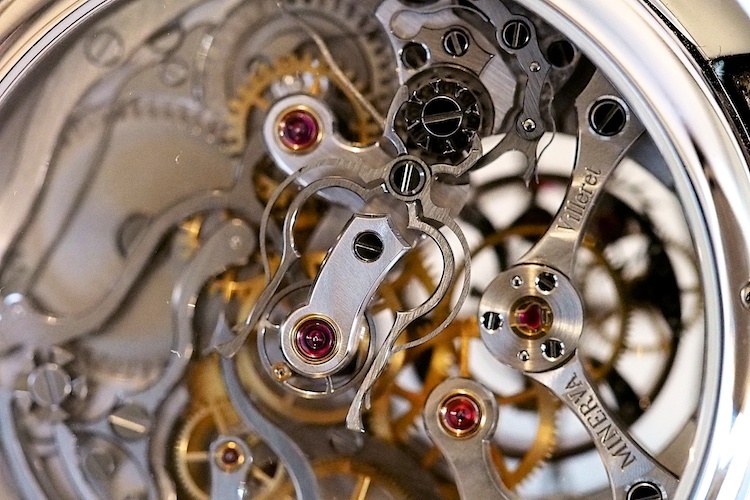 Amazingly, the finish on the final watch will, we were told by CEO Jerome Lambert, be even better than that on the already superlative prototype. 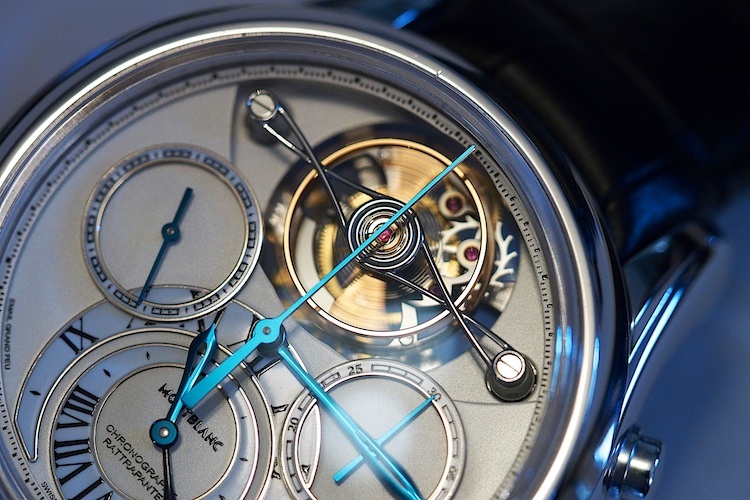 The watch is expected to retail for approximately EUR 250,000 when it becomes available. 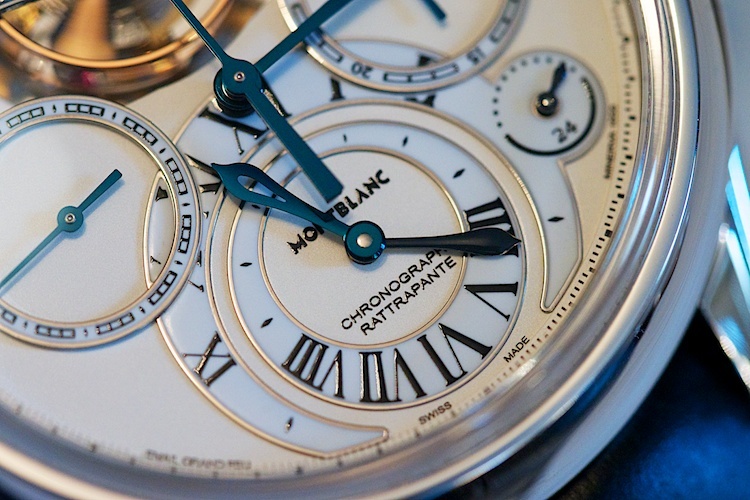 The Montblanc Exotourbillon Rattrapante: “exotourbillon” four minute tourbillon, vibrating at 18,000 vph; the time in two time zones, with day/night indication, running seconds, 30 minute chronograph dial and split seconds display. 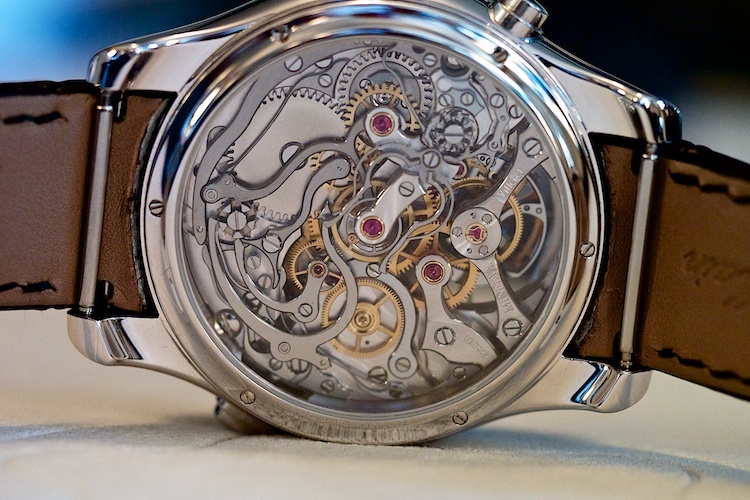 Case, white gold, 47mm x 17.5mm (and the space is very well used.) 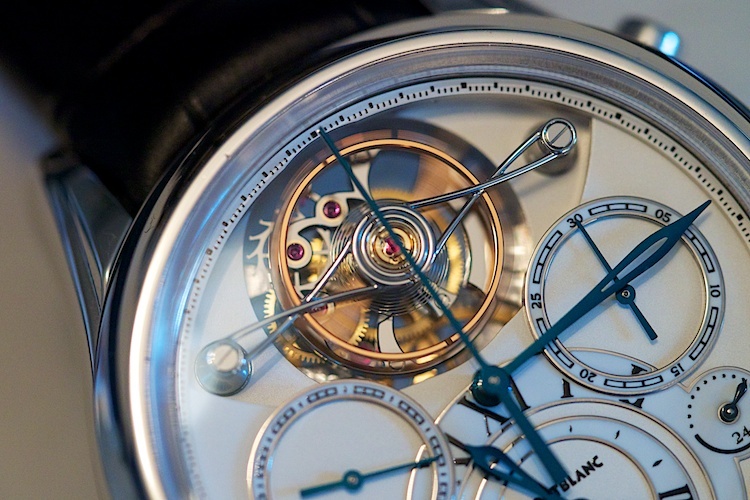 Movement: Montblanc Minerva Manufacture Calibre 16.61, 38.40 x 11.90mm, 411 components with rhodium-plated nickel silver plates and bridges. Phillips overcoil terminal curve balance spring. Hand-wound, power reserve about 55 hours. A limited edition of 18 pieces worldwide. —Jack Forster is the Editor-in-Chief of Revolution Magazine USA. 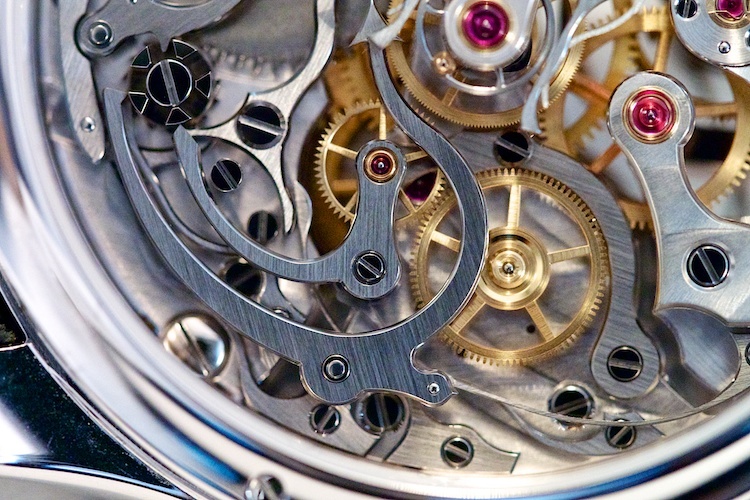 Follow @revolutionmag on Instagram and @revo_online on Twitter for news and views from the world of fine watchmaking.